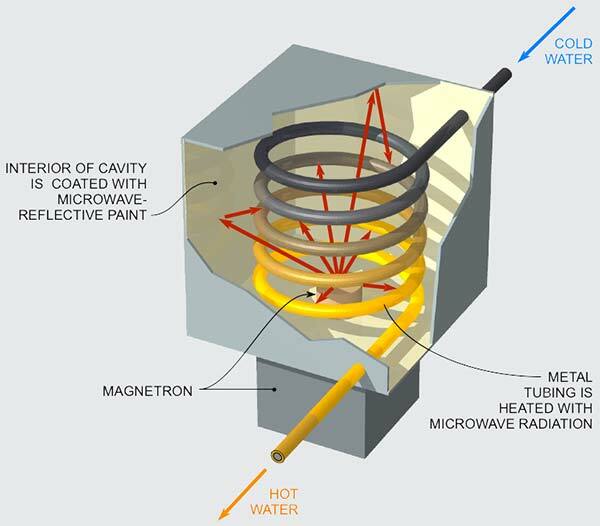 This describes an efficient water heater that uses microwave radiation to heat a coiled water pipe. The radiation is contained in a metal cavity, painted inside with microwave-reflective paint, similar to that used in home microwave cooking ovens, and on stealth aircraft. The walls of the cavity can be perforated inspection panels whose openings are no more than about half the 12.5-cm long microwave wavelength. The water inside the pipe limits the temperature to 100°C; however, the color indicates that the pipe is cooler at the input end, and hotter after exposure to microwave radiation. Microwave heating is inherently more efficient than gas heating, and provides on-demand hot water without the need for a traditional water tank that is kept hot for only sporadic use.